I mentioned in my portfolio half year review that I had taken a new position in Softbank and here is the full thesis. 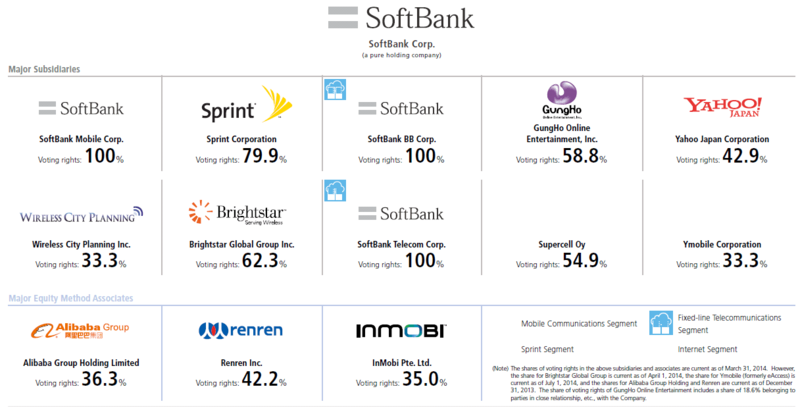 Softbank (TKS:9984) (ASE:SFT) is a Japanese telecoms company and is one of the largest in the world. Investors may know the company because of its 36.3% holding in Alibaba (NYSE:BABA) and 80% ownership of US telecoms company Sprint. The investment thesis for Softbank is relatively straight-forward. It currently owns a stake in Alibaba worth ¥9.6tn, yet its market cap is only ¥8.8tn. In addition to the Alibaba stake however, you get an 80% stake in Sprint (NYSE:S), a 43% stake in Yahoo Japan (TKS:4689), and operating businesses with net income of ¥720m per year. Softbank is quite a complicated holding company with percentage stakes in a variety of businesses, which make unpicking its financials difficult. This may be one reason for the steep discount to its holdings. To come up with a value of the operating business I have valued them based on net income rather than as minority equity holdings. For the mobile comms segment I apply a 12x multiple to get a value of ¥7.3tn which I feel is fairly conservative. For the mature fixed line segment I attach an 8.5x multiple to get a value of ¥926m. After adjusting for minority interests, I get a total valuation of ¥7.4tn. Debt: Softbank is at first glance a very indebted company, with net debt of ¥7.2tn. But this includes the consolidated debt of the three equity holdings above, which you should ignore when valuing using the equity method. Sprint has net debt of ¥3.7tn, and Alibaba has net cash of ¥1.4tn. Yahoo Japan’s net debt is around 0, so in total Softbank’s “operating” debt is ¥5tn. This gives me an equity value of the operating business of ¥2.5tn (Total value – net debt). Adding this to the equity valuations above gives me a total valuation for Softbank of ¥15.1tn vs current market cap of ¥8.8tn. To be honest I’m not too interested in Softbank as a business, or Sprint, but I am very interested in Alibaba. It’s currently valued at a P/E just over 50, but I think this is actually quite fair for what is a giant company still growing at a phenomenal rate. If you had invested in Google back in 2004 when it was trading at a similar P/E you would have earned very nice returns. I would ordinarily buy a stake directly in Alibaba, but at this price Softbank appears to be selling for just its Alibaba stake with the rest thrown in for free. Therefore I think it’s a better value proposition than just Alibaba and should increase in value along with Alibaba. One final note I will make that could be possibly holding back the price of Softbank is the tax that would be due on its Alibaba gains should it sell. However I don’t think it’s likely they will sell the stake, and even if they decide to divest I think they will do a spin-off in a similar fashion to that done by Yahoo with its Alibaba shares to avoid capital gains taxes. Shares trading in Toyko have a minimum lot size of 100, and as I didn’t want to make Softbank a large position I have instead invested through its Athens shares trading under the ticker SFT for around €52. Why not just invest in the OTC: SFTBY? Nice article. Would like to see more thought on its other holdings (Snapdeal, etc). I’m based in the UK and it isn’t easy to buy OTC US stocks here, otherwise yes it’s a good option. Any thoughts given performance at Sprint and the share price action? Are you a buyer or seller?